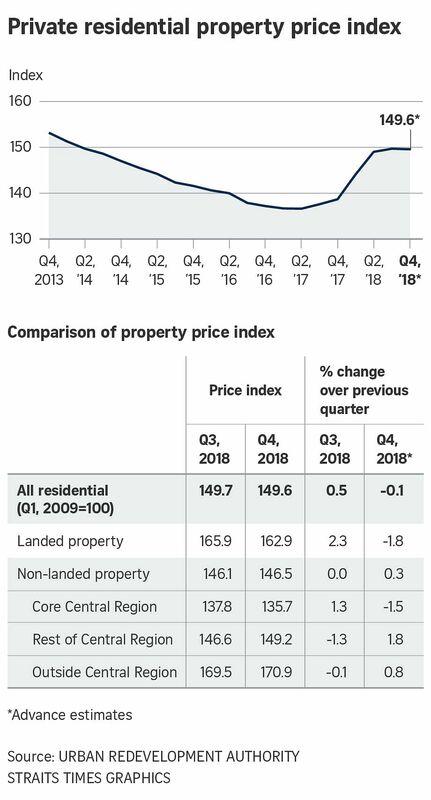 SINGAPORE - Singapore's private residential prices saw their first quarterly decline since the second quarter of 2017, as the market continued to feel the effects of the July 6 cooling measures. Private home prices dipped by 0.1 per cent quarter on quarter in the final three months of 2018, reversing from a 0.5 per cent increase in the third quarter. For the whole of 2018, prices rose 7.9 per cent, compared with the 1.1 per cent increase in 2017. This was according to flash estimates from the Urban Redevelopment Authority (URA) released on Wednesday (Jan 2). The last time overall private home prices turned negative was the 0.1 per cent decline in the April to June quarter of 2017. Prices of landed homes led the slowdown, falling by 1.8 per cent, reversing a 2.3 per cent rise in the third quarter. Prices of condominiums and private apartments edged up 0.3 per cent after no change in the previous quarter. Prices of non-landed private residential properties decreased by 1.5 per cent in Core Central Region (CCR), compared to the 1.3 per cent increase in the previous quarter. Mr Alan Cheong, senior director of research and consultancy at real estate services provider Savills Singapore, said: “Prices have stabilised since the July 2018 round of cooling measures. However, we believe that the index was reined in by the drop in resale prices of landed property, while new (non-landed) sale prices have likely gone up. “For landed properties, as there are hardly any new launches in most quarters, price changes are a reflection of the transactions in the resale market." Mr Cheong added: "For the first quarter of 2019, the maiden launch of new projects derived from collective sales sites may lift the index up marginally as the land was purchased at relatively high prices in the 2017 and early 2018 period." In terms of location, prices in the Rest of Central Region (RCR) increased by 1.8 per cent in the fourth quarter, after registering a decrease of 1.3 per cent in the previous quarter. Prices in Outside Central Region (OCR) increased by 0.8 per cent, after registering a 0.1 per cent decrease in the previous quarter. For the whole of 2018, prices in CCR, RCR and OCR rose by 6.2 per cent, 7.4 per cent and 9.5 per cent respectively. ERA Realty key executive officer Eugene Lim noted: “The moderate price increases seen in the RCR and OCR were possibly due to new project launches such as Parc Esta, Kent Ridge Hill Residences, Whistler Grand and Arena Residences. “We are expecting prices to hold steady in 2019, with (40-plus) new launches lined up over the year,” he added. The flash estimates are compiled based on transaction prices given in contracts submitted for stamp duty payment and data on units sold by developers up till mid-December.